Climate negotiations are making news as the 24th Conference of the Parties (COP24) to the United Nations Framework Convention on Climate Change (UNFCCC)gets underway at Katowice, Poland (Dec 2-14, 2018).Also, the period between November 25th (International Day for the Elimination of Violence against Women) and December 10th (Human Rights Day) is the 16 Days of Activism against Gender-Based Violence Campaign – a time to step up efforts and galvanize action to end violence against women and girls around the world. One of the key drivers of this climate conference is getting in place the Paris Rulebook– the rulebook to implement the Paris Climate Agreement agreed at COP21. With the Intergovernmental Panel Climate Change (IPCC) report released earlier this year giving the world just twelve years to cut emissions significantly to prevent irreversible global warming, it’s essential that the Paris Rulebook be put in place with nations stepping up their efforts to cut emissions. Global warming leaves the most vulnerable most at risk – the poor, the indigenous peoples, women, children, endangered species, coral reefs, etc. 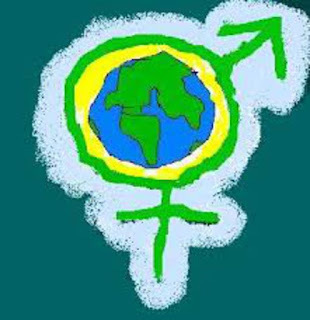 Climate action can help curb environmental drivers of violence against women. Monster natural disasters, supersized thanks to climate change, lead to displacement, disease, violence and war, all conditions that affect the most vulnerable in society more than others. The People’s Demand for Climate Justice frames climate action in the lens of social justice and environmental justice. When intersectionality of climate change and challenges to human security climate justice and a Just Transition are needs of the hour. As climate negotiations continue and nations bicker over words and Big Oil subtly and overtly lobbies to maintain the status quo – economies fuelled by fossil fuels – some positive action taken over the past year by young people, women and indigenous people helps provide a gleam of hope. Instead of remaining climate victims women, young people and indigenous communities have emerged as the most powerful heroes initiating powerful climate action. From Chipko to today’s Climate Action, women and indigenous communities have stood up to exploiters and protected the environment. Vandana Shiva the prominent Indian environmental activist, who was and key to both the ChipkoMovement of yesteryears and contributes powerfully to climate action and climate justice today puts it best when she says, “We have learnt from the forests. And the forests teaches us diversity, it teaches us freedom, it teaches us democracy.” Protecting forests and adding to forest cover and sustaining urban green cover are among the truest climate actions. Forests and their humus rich soil are the most natural and powerful climate sinks available to us. Organic farmer and soil conservation can also exponentially increase natural carbon capture. Through projects that protect and sustain forests and promotion of organic regenerative agriculture, forest-dwelling communities, farmers, and indigenous people can be made stakeholders of climate action and beneficiaries of climate finance. Thus ensuring climate justice. As Youth Day activities and Indigenous Women‘s Day was observed in the first week of COP24, it makes sense for those on the frontlines of climate change be given a seat at the table, a voice that is heard, and opinions and concerns that are taken into account at climate negotiations in order for the “just transition” to a “fossil fuel free future” to happen quickly. And the most obvious way to fund this just transition to a low carbon growth model is to move the money from war to climate action.For an efficient transition to a world where global warming is kept under 1.5 degrees, the Paris Rulebook needs to honour the rights of people not the profits and power of Big Oil. It should includeHuman Rights, Indigenous People’s Rights, Intergenerational Equality, Just Transition, Food Security, Gender Equality, Public Participation, Ecosystem Integrity and Protection of Biodiversity. The stories of the people on the frontline of climate change will put a human face to bland facts and figures in the climate negotiations. Teaching children about the effects of climate change and getting children and young people in proposing to solutions climate change and involved in climate adaptation programmes will add a fillip to environmental studies, climate action and even sustainable development. Case in point, the many post cards from children around the world who were taught about climate change, which will go on to form a massive poster on a glacier in Switzerland is a powerful symbol of the next generation’s commitment to climate change and concern for climate change. Human activities on land and deforestation contributed to an additional 5 billion tonnes of carbondioxide this year. Emissions from the transport sector and automobiles using fossil fuels have also continued to rise. Fossil fuels remain the mainstay of power grids globally. When taxes are imposed on fossil fuels, riots break out as seen in the City of Lights and Love, Paris becoming the city of riots and rampage this past week. This is mainly because stop gap taxes are imposed instead of facilitating change that does not burden the people but justly taxes corporations. Corporations continue to plunder resources with impunity for profits with no thought to people and planet and the governments are seen complicit with them, as they and their rich leaders benefit from massive tax breaks even as the common person is taxed for using the car or filling its tanks with fossil fuels. Environmentalists have urged governments to bring forward targets to ban the sale of all petrol and diesel vehicles, but before that public transport needs to be green and enhanced to cater to the needs of people – e.g., Luxembourg becomes the first country to make all its public transport free. Electric vehicle policies need to be put in place like in Norway, with electric vehicle sales incentivized and petrol and diesel vehicles taxed. In the context of the developing world and to avoid overconsumption, conversions of fuel cars to hybrid or electric mode needs to be promoted as well. This could yield green jobs and help fuel a truly just transition. The needs, voices and efforts of women, young people and indigenous communities need to be front and centre in the road to an anthropogenic climate change–free world.